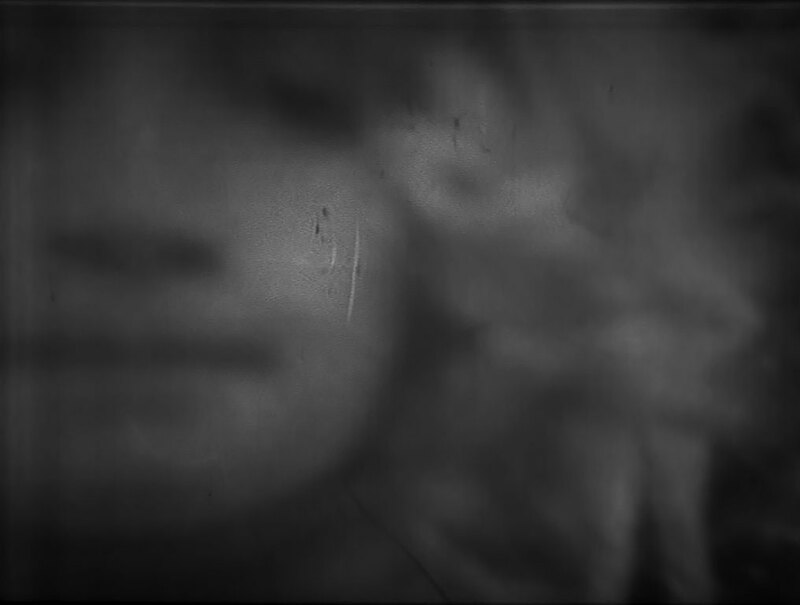 Hauntology Of The Dead Past (1965) – Out Of The Unknown. 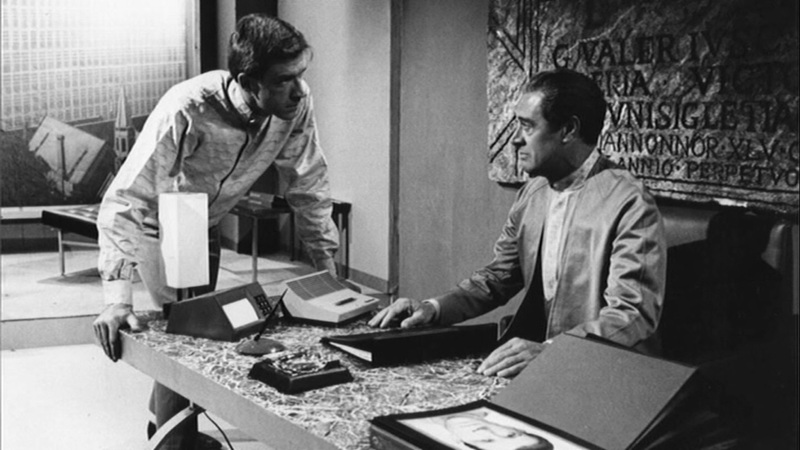 The BBC Science-Fiction anthology series, Out Of The Unknown (1965-1970), was famous for producing a wide range of intellectual sci-fi drama, exploring ideas and concepts more than spectacle and scale. With adaptations from a range of writers, including John Wyndham and J.G. Ballard, the surviving episodes of the series are both stimulating and useful in terms of 21st century aesthetic philosophy. 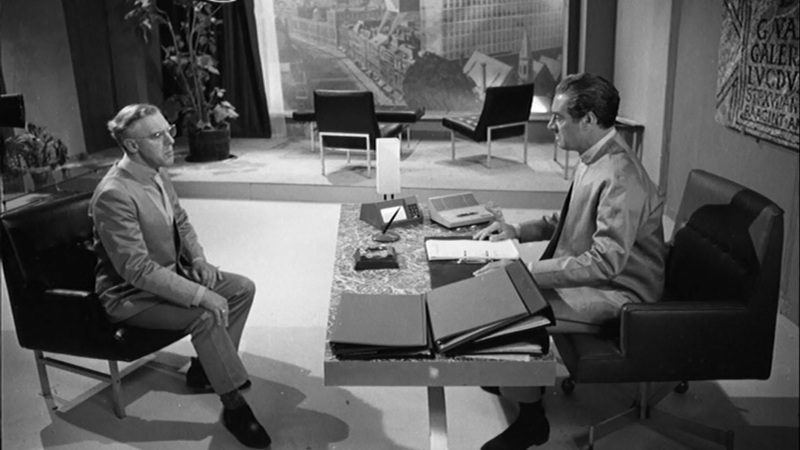 The feeling that the episodes are discussing a number of, still relevant, issues is one that haunts, especially as the series is coming close to fifty years old (as well as the original stories themselves being even older). 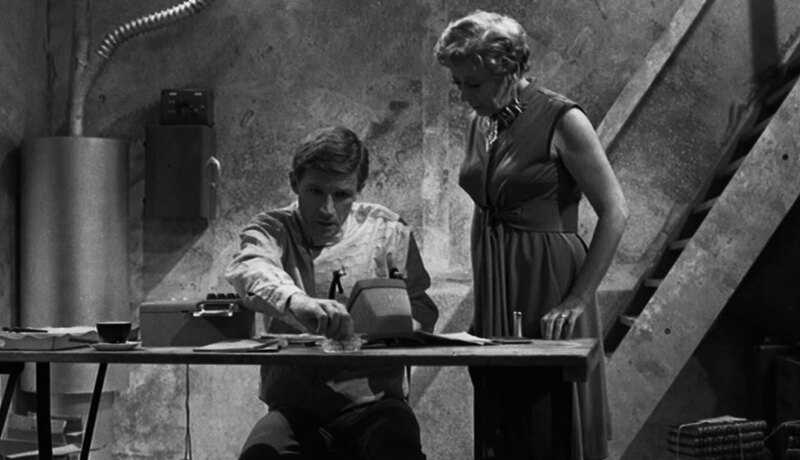 On watching an episode from its first series recently, The Dead Past (1965), whilst at the same time reading ideas surrounding the theory of hauntology by the writer, Mark Fisher, (Specifically Ghosts Of My Life, 2014, Zero Books) the two works seemed to connect and were clearly discussing ideas along the same lines. The Dead Past is adapted from a short story by Isaac Asimov and is directed for the series by John Gorrie (with a script adapted by Jeremy Paul). The narrative concerns a history professor, Arnold Potterley (George Benson), who is seeking permission from his research council to use a technique of Chronoscopy in his own research known colloquially as “time-viewing”. According to him, he requires the technique, which allows the viewer to see any moment in history replayed, for his study in ancient civilisations, specifically of their sacrificial fire rituals. He is denied the use but secretly seeks help from a new physics researcher, Jonas Foster (James Maxwell), whose gradual research into the suppressed field with the help of his science-journalist uncle, Ralph Nimmo (Willoughby Goddard), progresses to the point of building a chronoscope in the professor’s basement; almost as a rebellious act against the supposed “intellectual anarchy” that such illegal research is filed under. All the while, Potterley’s wife, Caroline (Sylvia Coleridge), is having nightmares about their deceased daughter who is later revealed to have died in a fire at their house at a young age (which may or may not have been caused the professor’s cigarette, causing his subsequent aversion to smoking as seen in the play). Overhearing what the chronoscope can do, she becomes hysterical with the idea of seeing her daughter again and begs Foster to show her. Though Arnold’s own desire to use the machine is also for more personal reasons (he has projected the potential guilt over his daughter’s death to the problem of the misrepresentation of the community of his research, seeking to prove that they did not sacrifice children in fire), he sees the potential danger in his wife becoming obsessed with watching the images of her daughter again: “You want to live those years over and over again, watching a child who will never grown up?”. Arnold destroys the machine though not before his research application leader, Thaddeus (David Langton), has got wind of their folly and has them arrested. They argue with him about progress and morality in science but he reveals to them why the machine is suppressed; that the machine will not simply allow for the seeing into any personal past but will be “The end of privacy”. As proof of what he says, he plays them back all of the events that have just happened on the government’s own secret chronoscope. There is, however, one final twist, with Ralph admitting that he has sent all of the research Foster has done on the chronoscope to all of his major contacts. 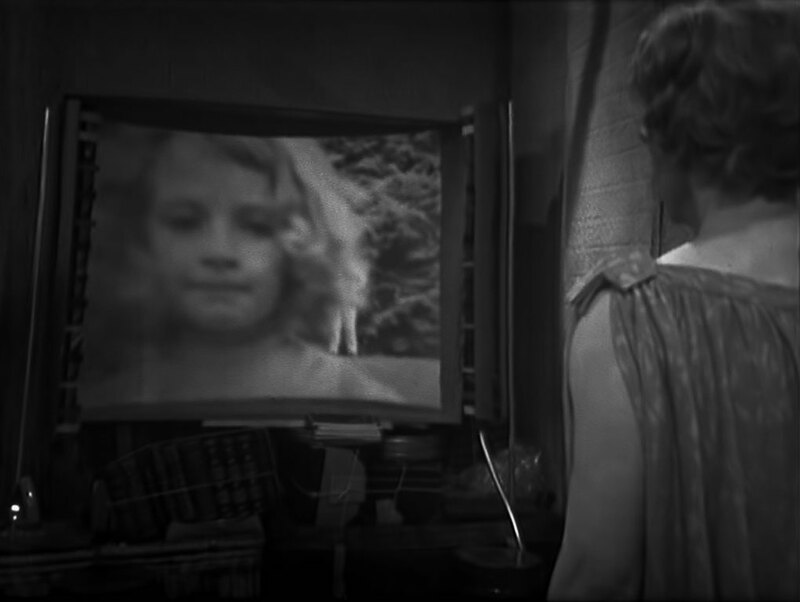 The play ends with Caroline watching footage of her dead daughter playing with Arnold over and over again; the chronoscope now clearly being available. The first refers to that which is (in actuality is) no longer, but which remains effective as a virtuality (the traumatic ‘compulsion to repeat’, a fatal pattern). The second sense of hauntology refers to that which (in actuality) has not yet happened, but which is already effective in the virtual (an attractor, an anticipation, shaping current behaviour). (2014, p.19). The first aspect is relatively obvious in the context of The Dead Past, even in the story’s title where it matters little that the past and its people are no longer here; their effect on us is still dangerously palpable. It is even more fitting that Fisher describes the theory in the context of a Freudian trauma that forces a “compulsion to repeat”. Gilles Deleuze writes of this compulsion in Difference And Repetition, stating that “The traditional theory of the compulsion to repeat in psychoanalysis remains essentially realist, materialist and subjective or individualist. It is realist because everything “happens” between presents.” (1994, p.128). The play’s ending again is one of the most startling realisations of this concept where Caroline does exactly what her husband warned that she would do before he destroyed the first machine. Fisher also writes that “Haunting, then, can be construed as a failed mourning.” (2014, p.22) and this is an extreme example of diving into the deep pool of such a failed mourning; whereas her nightmares were a side-effect of grief, they failed to stop her from leaving the house or doing other things which are hinted at being lost by the play’s conclusion.